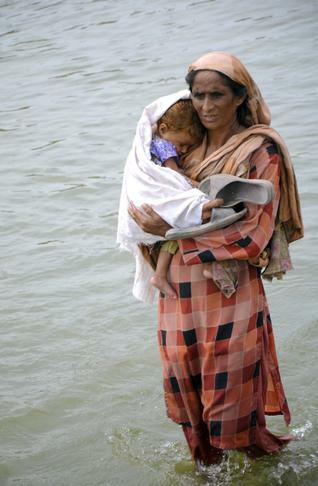 The worst floods in Pakistan’s history provided a good opportunity for both the South Asian nations to come closer. Accepting Indian aid offers half-heartedly and that too after US insistence, Pakistan has given an impression that it is convinced that its policy on India cannot change. Pakistan’s initial response to the Indian offer of five million dollars was a positive one but then it was unsure how to respond. It took several days for Pakistan to finally accept the offer, saying that the aid had to come through the UN. Now, a total of $25 million Indian assistance for flood relief efforts in Pakistan has to be spent by the UN. Pakistan’s foreign minister Shah Mehmood Qureshi had said that the delay was due to the sensitivities involved in the relationship with India. Even, a section of policymakers, conspiracy theorists in media and some India-centric elements within the Pakistani establishment blamed India for opening floodgates of its dam to inundate Pakistan’s cities and towns. While building public opinion, they did not care that their contention was technically wrong. The fact is that the rivers that caused destruction in Pakistan do not originate in India. Some defence analysts argue that Pakistan’s strange response towards India’s aid offer was meant not to get obliged. “Pakistan reacted politically towards Indian humanitarian gesture. The destruction is so colossal that petty politics must be avoided. Pakistan asks for help and when it is offered by a neighbour, its ego comes its way. The main hurdle was that Pakistan did not want to be obliged,” argues defence analyst General Talat Masood. India and Pakistan have made major efforts in recent months to build confidence in their relations, which were badly strained by the Mumbai 2008 terror attacks that India blamed on militants from Pakistan. If Indian civil society, volunteers and NGO’s were allowed to do relief work in the flood affected areas, this could have been an ideal confidence building measure in the relations of the two countries. Certainly, it would have served the spirit of Thimphu where Pakistani PM Yusuf Raza Gilani and his Indian counterpart Manmohan Singh tasked their top diplomats to create CBMs. An opportunity is still not lost if governments, media and civil societies in both the countries come forward and create enough space to use this calamity into an opportunity. -Editor’s Note for Pakistanis for Peace- The writer is spot on with his analysis of Pakistan’s aid offer from India. During times of a humanitarian crisis of biblical proportions, its political response was petty and irresponsible to its citizens. Furthermore, half heartedly accepting several days after the response does little to build on the goodwill. Either accept it right away with gratitude (our advice) or reject it outright. It did neither and so was ineffective in either cause. The politicians of Pakistan continue to show their incompetence by ineffectively managing the affairs of the country both domestically and internationally.